As the evenings wear on, the charming courtyard bar transforms from a chilled drinking and dining spot into a raucous bar with a fully packed weekly schedule of events – weeknights include an open mic night, a pub quiz and story-telling sessions. On weekends, live performances from soul house band Tavey Lean and The Solid Gold Dream Machine and regular DJ sets draw in the crowds. Known fondly as ‘pizza Great Leap’ for its world-class pies, #45 is a family-friendly daytime destination – packed with families and the diplomatic set – around which a good weekend naturally evolves. At night it loosens the tie and eases back into its rambunctious old self, welcoming a truly mixed crowd with its inventive ales and professional service. It also has some of the best burgers in town. Jing A knows a thing or two about lubricating punters with Beijing’s most innovative roster of cold ones. There’s something for everyone here, with shark-jumping brews like the The Imperial Pumpkin Monster Mash and Watermelon Xanadu. 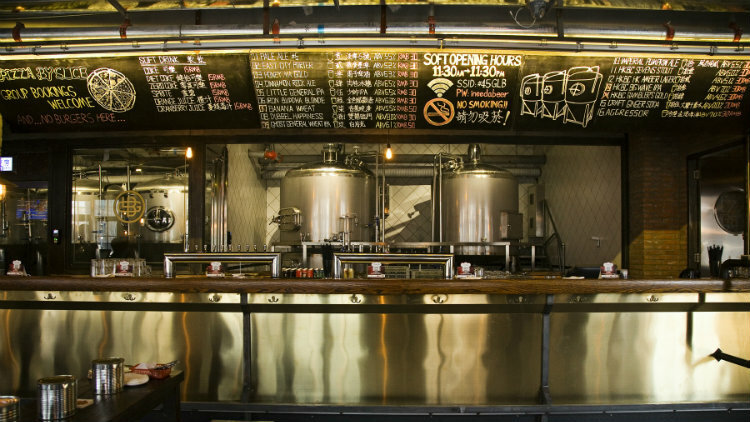 Supplementing its beers with a busy schedule of collabs and takeovers, the brewpub strikes the enviable balance of being exciting and relevant while retaining a homely comfort. It also offers an excellent menu of, largely, barbecue and grill-focused food to pair with the brews. China is a country that pulls no punches when it comes to spirits, whether that's the alcoholic or the ancestral kind. Just when you think you can't drink any more baijiu – China's national spirit – a visit to one of Beijing's specialist spirit bars will have you shouting 'ganbei' (cheers) before you know it. The team at dedicated baijiu bar Capital Spirits and The Distillery have made it their duty to educate the public on China’s most iconic yet contentious spirit. Stocking over 50 varieties and mixing up a selection of baijiu-based cocktails, even the most hesitant drinkers are bound to find something for them. If not, there's always their signature gin to get you going. Others not to miss The Black Moth and Red Dog. Why you’re hereSince opening last year, Blue Note has hosted world-class musicians, including Grammy-winning Chick Corea and Kamasi Washington, a Kendrick Lamar collaborator. What you’re dancing toSweet melodic blues as well as quirky beats from all over the world. Whoever came up with the adage that New York is the city that never sleeps clearly hadn't made it to Beijing. Nightlife in Beijing comes at you pretty fast, and there's no end of creative types coming up with new clubbing concepts to keep you partying until the early hours. Try these two on for size, and check out our weekly round-up of the best parties to plan your weekend.